Occurrence: Fresh or frozen fish including fish fingers, seafood snacks, fish paste, kamaboko and surimi. Surimi is found in pizza topping and as imitation crab, shrimp, or scallop and also in “meatless” hot dogs, hybrid ham and bologna, sausages, and pepperoni sticks. Fish and products thereof are listed in annex IIIa of the EU directive on labelling of foods. Gadus morhua was named by Linnaeus in 1758. However, G. morhua callarias, a low salinity, non-migratory race restricted to parts of the Baltic, was originally described as Gadus callarias by Linnaeus. This caused the first identified cod allergen to be named Gad c 1. There are very many articles describing "fish" allergy. The cod entry contains data from some of these as well as articles where cod is explicitly mentioned. Selected key articles on cod or fish allergy are summarised below. All 30 patients of Hansen et al. (2004)  reported oral allergy syndrome on consuming fish. Reported cutaneous symptoms included angioedema in 11 patients, urticaria in 14, eczema in 13, erythema in 6 and conjunctivitis in 2. Respiratory symptoms included asthma in 16, rhinoconjunctivitis in 13 and oropharyngeal swelling in 1 patient. Gastrointestinal symptoms (nausea, vomiting, diarrhoea, abdominal pain) were reported by 13 patients. The age at onset of fish allergy varied from <1 year to 20 years old, with most individual's allergy developing in childhood. Symptoms of fish allergy may only require a low dose of allergen. There is a report of a 2 year old girl suffering facial urticaria and angioedema after a kiss (Monti et al. 2003 ). Sakaguchi et al. (2000)  report the symptoms of 12 patients, age 1 to 40 years, with allergy to various fish as urticaria in 10/12 with wheezing and itching in the mouth respectively in the remaining individuals. Five of the patients with urticaria suffered additional symptoms of angioedema, cough, cough and stomach ache, cough with wheezing and vomiting, and hypotension, airway obstruction and diarrhea. 15 additional patients with atopic dermatitis, age 8 to 45 years, had specific IgE to fish. Sten et al (2004)  used commercial, glycerinated allergen of codfish for comparison with freshly thawed ocean pout, eelpout and eel. Hansen et al. (2004)  used commercial, glycerinated allergen of codfish, 1:20 w/v (Soluprick, ALK-Abelló) and fish gelatin diluted in saline 0.9% (0.5 g/ml). The gelatine was prepared from the skins of codfish by acid extraction (type A gelatine, Mr 60,000). Hansen et al. (1997)  used comercial extracts. Protocol: (controls, definition of positive etc)Hansen et al. (1997) , Sten et al (2004)  and Hansen et al. (2004)  considered as positive a weal with net diameter 3 mm larger than that of the negative control (a diluent of glycerol/NaCl). Hansen et al. (2004)  tested 30 clinically allergic patients with cod and fish gelatine. Sten et al (2004)  tested 18 patients. One patient was not tested with raw fish because of their high IgE level and the severe reactions to SPT (swelling of arm and itching) seen with some patients (these may include some of those from Hansen et al, 2004 ). Hansen et al. (1997)  tested 8 DBPCFC positive patients and 30 controls (3 DBPCFC negative, 8 non-atopic, 7 with pollen allergy and 12 with atopic dermatitis). Sten et al (2004)  reported that all 18 SPTs with cod extract were positive and 17 of 18 patients reacted to all fish species with generally large weals. Hansen et al. (2004)  report that all 30 patients gave positive SPT to cod extract and that 3/30 gave positive SPT to gelatine. Hansen et al. (1997)  report that all 8 DBPCFC positive patients gave positive SPT with cod extract. Commercial extracts were used with CAP. Fish gelatine used by Sakaguchi et al. (2000)  was prepared from different fish (eg, tuna, salmon, saurel, and mackerel) by 0.5 M acetic acid extraction and purified by differential salt precipitation. Hansen et al. (1996)  and Hansen et al. (1997)  prepared an extract from fresh raw cod. Hansen et al. (2004) , Sampson & Ho (1997) , Sampson (2001) , Sakaguchi et al. (2000) , Bugajska-Schretter et al. (1998)  and Dory et al. (1998)  used CAP. Hansen et al. (1996)  also compared Phadebas, CAP, Magic Lite and Maxisorp. Sten et al (2004)  used direct Maxisorp-RAST and RAST inhibition. Sten et al (2004) , Hansen et al. (2004)  and Hansen et al. (1996)  also used a histamine release test. Sakaguchi et al. (2000)  used ELISA for gelatine specific IgE. Untersmayr et al. (2005)  used sera from 3 patients. Sten et al (2004)  used sera from 18 patients. Hansen et al (2004)  used sera from 30 clinically fish allergic patients. Sakaguchi et al. (2000)  used sera from 12 fish allergic patients and 65 patients with atopic dermatitis. The 15 with IgE to fish were tested for IgE to fish gelatine. Dory et al. (1998)  used sera from 12 patients. Hansen et al. (1996)  and Hansen et al. (1997)  used sera from 8 DBPCFC positive patients and 30 codfish tolerant controls (3 DBPCFC negative, 8 non-atopic, 7 with pollen allergy and 12 with atopic dermatitis). Hansen et al. (2004)  report that sera from all 30 patients reacted with cod extract (range 0.36–477 kUA/l; mean 33.65 kUA/l). Sten et al (2004)  reported that all 18 sera reacted with all 4 fish extracts. The amount of specific IgE were in all cases higher for codfish compared with the other fish species. However, all extracts were able, with dose-dependency, to inhibit the binding to codfish and ocean pout for all sera at least to some extent. Sampson & Ho (1997)  and Sampson (2001)  sugest that a specific IgE level predicting clinical fish allergy with 95% confidence was 20 kUA/L. The sensitivity was 25% and specificity 100%. Challenge was recommended for IgE levels 0.35 - 20.0 kUA/L. Sakaguchi et al. (2000)  report specific IgE levels of 0.5 - 18.9 kU/l for cod in 5/12 fish allergic patients and 0.45 - 97.1 kU/l for all the fish tested (cod, mackerel, salmon, saurel and tuna) in the 12 patients. 7 of these patients had specific IgE to fish gelatine with 0.45 - 51.5 kU/l. 5 of these sera were tested with gelatines from different species and in general showed similar IgE binding. 15/65 patients with atopic dermatitis showed 0.48 - 20.2 kU/l for either cod or tuna. 10 of these patients had 0.5 - 49.9 kU/l specific IgE to fish gelatine. Bugajska-Schretter et al. (1998)  report cod specific IgE levels of 1.4 - 42.2 kU/l (class 2 to 4). Salmon and tuna specific IgE were also measured and were class 1 to 4. Dory et al. (1998)  report cod specific IgE levels of 1.9 - 92.9 kU/l (class 2 to 4). Hansen et al (1997)  reported that sera from 8 codfish allergic patients had specific IgE to other fish species, and in inhibition-studies extracts of herring, mackerel, and plaice were capable of inhibiting reactivity to codfish in a varying degree. Untersmayr et al. (2005)  followed the methods of Lammeli (1970) , implying that the samples were reduced although this is not explicitly stated. Sten et al (2004)  used a 1.0 mm 16% separating gel with a 4% stacking gel. The samples were diluted in a reducing buffer and boiled before use. Bugajska-Schretter et al. (1998)  used 12% separating gels with 5% stacking gels following Lammeli (1970) . Extracts were heated at 95° C for 3 minutes. Approximately 100 µg of each fish extract were loaded per centimeter of gel. Galland et al. (1998)  used stacking gels of 4% and separating gels of 12% acrylamide in 25 mM Tris–HCl (pH 8.3), 0.18 M glycine, 0.1% (w/v) SDS. Each sample contained 10 mM Tris–HCl (pH 8.0), 1 mM EDTA, 1% (w/v) SDS, 40 mM DTT, 10% (v/v) glycerol, 0.015% (w/v) bromophenol blue and was heated at 100°C for 3 min before loading. Dory et al. (1998)  used 10-20% acrylamide separating gels. Hansen et al (1996)  used 16 % separation gels with a 5 % stacking gel. Samples were diluted in a sample buffer containing 5 % mercaptoethanol and were boiled before use. Untersmayr et al. (2005)  blotted the separated proteins onto nitrocellulose by the method of Towbin. Blots were saturated with blocking buffer containing 0.5% (w/v) dried milk powder and incubated overnight at 4°C with sera from patients or healthy control subjects. Bound IgE antibodies were detected with iodine 125–labeled anti-human IgE antibodies (IBL, Hamburg, Germany) and visualized by means of autoradiography. Sten et al (2004)  blotted the separated proteins onto a polyvinylidene fluoride (PVDF) membrane (Millipore, Bedford, MA) for 1.5h (I=1.0 mA/cm2). The membranes were blocked with tris buffered saline with 0.5% (v/v) Tween and 5% (w/v) BSA for 2 h at room temperature before incubating overnight at 4°C with the sera. For inhibition studies the sera were preincubated with extract (2 mg/ml) overnight. After washing, the membranes were incubated with anti-IgE horseradish peroxidase (HRP) (Dako A/S, Glostrup, Denmark) for 2 h and washed again. ECL Western blotting detection reagent (Amersham Pharmacia Biotech) was used as substrate to reveal IgE binding. Bugajska-Schretter et al. (1998)  transferred the separated proteins onto nitrocellulose by the method of Towbin. The nitrocellulose was cut into strips and blocked with phosphate buffered saline, pH 7.5, with 0.5% (v/v) Tween 20. The strips were then incubated overnight at 4°C with patients sera diluted 1:10 (v/v) in blocking buffer. Strips were washed 3 times with blocking buffer and bound IgE were detected with 125I anti-IgE and revealed with autoradiographic film with intensifying screens at -70°C for 24-72 hours. Galland et al. (1998)  transferred proteins onto a nitrocellulose membrane. This was blocked with 0.3% (v/v) Tween 20 in 20 mM Tris–HCl buffer (pH 7.4), 0.15 M NaCl (TBS) and incubated with sera from cod allergic patients (diluted 1:10 (v/v) with 0.1% (v/v) Tween 20 in TBS) and then with 125I anti-IgE (diluted 1:10 with 0.3% (v/v) Tween 20 in TBS). IgE binding was detected by exposure for 72 h on a phosphor screen. Hansen et al 1996  transferred proteins onto nitrocellulose paper which was cut into strips and blocked in TRIS-buffered saline with 3% (w/v) powdered milk and 1.5% (v/v) Tween 20 (blocking solution). Then incubated with sera (1:10 v/v) in blocking solution. Bound antigen specific IgE was detected by anti-IgE diluted 1:12 (v/v) in blocking solution. IgE binding was detected by exposure to hyperfilm (Amersham) for 3, 7, and 14 days. Untersmayr et al. (2005)  report strong IgE binding to a band at 11.5 kDa and some faint bands at higher molecular masses which are removed on digestion. Sten et al (2004)  report that serum IgE from one individual bound only to a 40 kDa protein. 5 individuals had serum IgE which bound only to the 12 kDa allergen (Gad c 1). The other sera contained IgE which bound to 3 or more proteins (i.e. at 12, 17, 40 and 55 kDa). Only 2 of 18 sera did not bind the 12 kDa allergen (Gad c 1). Codfish, ocean pout, eelpout or eel extracts all inhibited IgE binding. Bugajska-Schretter et al. (1998)  report that 24/28 sera showed strong IgE binding by parvalbumin near 12 kDa. The remaining sera bound parvalbumin more weakly. 7 sera recognised proteins of 200, 100, 80, 66, 35, 30, 25, 20 and 15 kDa. Removal of calcium reduced binding to parvalbumin in most sera tested. 3 sera were used to show that cross-reactive allergens occurred in tuna, salmon, perch, carp and eel. Dory et al. (1998)  report IgE binding to proteins of 12, 22, 30, 45, 60, 67, 104 and 130 kDa from crude cod extract. Further 18, 41 and 80 kDa bands appeared following storage of fish. All the proteins bound an anti-parvalbumin monoclonal antibody suggesting either aggregates of parvalbumin or cross-linking of parvalbumin with other proteins or the presense of larger parvalbumin homologues. Hansen et al. (1996)  report that sera from all 8 DBPCFC positive patients bound to the 12 kDa allergen. Some control subjects with atopic dermatitis bound higher molecular mass proteins. Hansen et al. (1996)  used fresh raw cod in concentrated blackcurrent juice (1:4 diluted with water). Hansen et al. (2004)  used fish gelatine in concentrated blackcurrent juice, water and Elemental 028. Blind:Hansen et al. (1996) , Sampson & Ho (1997) , Helbling et al. (1999) , Sampson (2001)  and Hansen et al. (2004)  used DBPCFC. Hansen et al. (2004)  challenged 30 cod allergic patients with fish gelatine. Helbling et al. (1999)  challenged 9 fish allergic patients with catfish, cod and snapper. Sampson & Ho (1997)  challenged 20 patients with "fish". Sampson (2001)  challenged a further patient. Hansen et al. (1996)  report 11 challenges on patients aged 21 to 31 years. Hansen & Bindslev-Jensen (1992)  also challenged some of these patients. Dose response:Hansen et al. (1996)  and Hansen & Bindslev-Jensen, 1992  gave doses of 5 μg. to 5g., with a total cumulative dose of 6.7g. The lowest dose to cause subjective symptoms was 6 mg. Objective symptoms occurred at 56 mg and higher doses. Hansen et al. (2004)  gave doses of fish gelatine up to a cumulative dose of 14.61g. Hansen et al. (2004)  report that only one of the 30 patients mentioned a mild subjective symptom of itching in throat following consumption of 7.61 g cumulative dose of gelatine. However, no further development of symptoms occurred following the final dose of gelatine. Helbling et al. (1999)  report that 14/19 challenges (74%) gave an objective response following oral challenge. The most common sign observed was emesis (37%); the most prevalent subjective symptom reported was oral allergy syndrome (84%). Three subjects reacted to at least three fish species and one subject reacted to two fish species tested. In regard to the positive challenges, the predictive accuracy of skin prick test and RAST was 84% and 78%, respectively. Sampson & Ho (1997)  report that 11/20 patients gave positive oral challenges with fish, 10 having cutaneous symptoms, 7 gastrointestinal and 1 respiratory symptoms. Hansen et al. (1996)  report that all 8 challenge positive patients reported oral itching, 2 also reporting nausea and 1 abdominal pain following consumption of fish. The objective symptoms observed were erythema in 4 patients, blisters in 4, angioedema in 3, oropharyngeal swelling in 2, asthma in 1 and vomiting in 1. 3 negative challenges were also reported but it was speculated that a dose above 6.7 g. might have produced symptoms. 7 of the 8 patients reported had previosly been challenged by a different protocol (Hansen & Bindslev-Jensen, 1992)  and had reacted including a single patient who suffered anaphylaxis. 3 negative challenges were also reported by Hansen & Bindslev-Jensen (1992). There is extensive data on cross-reactivity of allergens from different fin fish (Bugajska-Schretter et al, 1998 ; Helbling et al, 1999 ; Sten et al, 2004 ; Van Do et al 2005 ). Sten et al (2004)  showed, for example, similar skin prick reactions with ocean pout, eelpout and eel, and codfish whilst Hansen et al. (1997)  reported that 7/8 cod allergic patients were SPT positive with extracts of mackerel and all were positive with herring and plaice (a single DBPCFC negative individual was also positive with herring and plaice). Bugajska-Schretter et al. (1998)  report salmon and tuna specific IgE as class 1 to 4 in patients with class 2 to 4 with cod and Hansen et al. (1997)  reported similar immunoblot results with extracts of mackerel, herring and plaice compared to cod. Van Do et al (2005)  used SPT and ELISA inhibition with 12 patients and their sera to characterize the cross-reactivities of native and some recombinant parvalbumins from 9 species (cod, Gadus morhua, Atlantic salmon, Salmo salar, Atlantic mackerel, Scomber scombrus, tuna, Thunus albacares, herring, Clupea harengus, wolffish, Anarhichas sp., halibut, Hippoglossus hippoglossus, flounder, Platichthys flesus, and Alaska pollack, Theragra chalcogramma). Cross-reactivity was generally observed although some parvalbumins and extracts were poor inhibitors of IgE binding to cod for some sera i.e. 2/10 sera did not show inhibition by salmon parvalbumin (although surprisingly recombinant salmon parvalbumin caused inhibition). The abstract Hansen et al (1995)  reported that 9 patients who were DBPCFC-positive to cod also showed various degrees of clinical sensitivity to mackerel, herring, plaice by DBPCFC. The cross-reactivity is not complete with individual patients reacting differently to various fish species (Sicherer et al, 2004 ; Tanaka et al, 2000 ; de Martino et al, 1990 ). In general, cod may be the species most likely to provoke a reaction in fish allergic patients (Sten et al, 2004 ). Hilger et al (2004)  and Hamada et al (2004)  show that there is also IgE cross-reactivity between fish and frog parvalbumin allergens and report positive skin tests in fish allergic patients using recombinant frog parvalbumins. IgE from the sera of fish allergic patients also binds to frog parvalbumins. Cross-reactivity is less likely between bony and cartilaginous fishes and there is a report of allergy to dogfish and rays without cross-reactivity to hake, horse mackerel, swordfish or anglerfish (Rodríguez et al, 2003 ). More surprisingly, there is a report of sensitisation to sole without cross-reactivity to other fish (Asero et al, 1999 ). There is clear evidence for a 40 - 43 kDa allergen from cod. Hansen et al. (1996)  report that 2/8 cod allergic sera and also some sera from their patients with atopic dermatis recognised this allergen. Sten et al (2004)  show binding in all 6 representative patients. The properties of this allergen are less clearly defined. Bernhisel-Broadbent et al. (1992)  detected binding to raw but not cooked cod while Dory et al. (1998)  report the allergen in stored but not fresh cod. Hansen et al (1994)  reported that boiling fish for up to 4 h did not reduce allergenicity. Das Dores et al. (2002)  report cloning the 41 kDa allergen and its identification as a glyceraldehyde 3-phosphate dehydrogenase (http://us.expasy.org/cgi-bin/niceprot.pl?Q8AWX8). The same group had earlier purified the 41 kDa allergen (Galland et al, 1998 ). The difference in the observed mass and pI may result from post translational modification (there was a fainter band at 36 kDa). However, the different N-terminus and the amino acid composition leave open the possibility of two different allergens. The 41 kDa allergen was also reported to bind to an anti-parvalbumin monoclonal antibody. 3 residues from the original Gad c 1 sequence were suggested as being a possible cause of cross-reactivity but not all are found in recent sequences from DNA and the calcium binding loops conformation is unlikely to be conserved. Untersmayr et al. (2005)  show that IgE binding to immunoblots is lost by cod extract on digestion by simulated gastric fluid for 1 minute at pH 1.25-2.5 but survives at pH 2.75-5.0. As well as the strong band at 11.5 kDa, some faint bands are present at higher molecular masses but disappear completely on digestion at pH 2.5 or below. Hansen et al. (1996)  report that the histamine release test gave 2 inconclusive results from the 8 cod allergics but good specificity. Hansen et al. (1997)  found similar to slightly reduced histamine release responses using extracts of mackerel, herring and plaice. Hansen et al. (2004)  report that all 30 patients were positive with the histamine release test with cod and 7 gave a positive histamine release test with fish gelatine. Similarly, Sten et al (2004)  reported that all 18 histamine release tests with cod were positive but that 2 patients were negative to ocean pout and eelpout and reacted only with high amounts of eel protein. Sicherer et al. (2004)  found the self-reported prevalence of allergy to fin fish was 0.4% using a telephone questionnaire (0.5% in adults). De Frutos et al. (2003)  report that children with fish allergy may acquire tolerance and that this is normally permanent. However, in two cases the children lost and then regained their allergy to fish. Makinen-Kiljunen et al. (2003)  report a case of allergy to fish roe without reaction to fish muscle. Ohnuma et al. (2001)  and Attaran & Probst (2002)  report that histamine fish poisoning is a common condition normally associated with consuming spoiled fish such as tuna or mackerel. This shows symptoms similar to allergy to fish. Allergic reactions on consumption of fish can arise from allergy to parasites such as Anisakis simplex (Daschner & Pascual, 2005 ). Hansen TK, Bindslev-Jensen C, Skov PS, Poulsen LK. Codfish allergy in adults: IgE cross-reactivity among fish species. Codfish allergy in adults. Specific tests for IgE and histamine release vs double-blind, placebo-controlled challenges. Hansen TK, Poulsen LK, Stahl Skov P, Hefle SL, Hlywka JJ, Taylor SL, Bindslev-Jensen U, Bindslev-Jensen C.
A randomized, double-blinded, placebo-controlled oral challenge study to evaluate the allergenicity of commercial, food-grade fish gelatin. Histamine fish poisoning: a common but frequently misdiagnosed condition. Ohnuma S, Higa M, Hamanaka S, Matsushima K, Yamamuro W.
An outbreak of allergy-like food poisoning. Dory D, Chopin C, Aimone-Gastin I, Gueant JL, Guerin L, Sainte-Laudy J, Moneret-Vautrin DA, Fleurence J. Recognition of an extensive range of IgE-reactive proteins in cod extract. De Frutos C, Zapatero L, Rodriguez A, Barranco R, Alonso E, Martinez MI. Re-sensitization to fish after a temporary tolerance. Prevalence of seafood allergy in the United States determined by a random telephone survey. Galland AV, Dory D, Pons L, Chopin C, Rabesona H, Gueant JL, Fleurence J.
Purification of a 41 kDa cod-allergenic protein. Tanaka R, Ichikawa K, Hamano K.
Sten E, Hansen TK, Stahl Skov P, Andersen SB, Torp A, Bindslev-Jensen U, Bindslev-Jensen C, Poulsen LK. Cross-reactivity to eel, eelpout and ocean pout in codfish-allergic patients. Utility of food-specific IgE concentrations in predicting symptomatic food allergy. Monti G, Bonfante G, Muratore MC, Peltran A, Oggero R, Silvestro L, Mussa GC. Kiss-induced facial urticaria and angioedema in a child allergic to fish. Helbling A, Haydel R Jr, McCants ML, Musmand JJ, El-Dahr J, Lehrer SB. Fish allergy: is cross-reactivity among fish species relevant? Double-blind placebo-controlled food challenge studies of fish allergic adults. Asero R, Mistrello G, Roncarolo D, Casarini M, Falagiani P.
True monosensitivity to a tropical sole. Rodriguez V, Gracia MT, Iriarte P, Bartolome B.
Sakaguchi M, Toda M, Ebihara T, Irie S, Hori H, Imai A, Yanagida M, Miyazawa H, Ohsuna H, Ikezawa Z, Inouye S.
IgE antibody to fish gelatin (type I collagen) in patients with fish allergy. James JM, Helm RM, Burks AW, Lehrer SB. Comparison of pediatric and adult IgE antibody binding to fish proteins. Porcel S, Leon F, Cumplido J, Cuevas M, Guimaraens D, Conde-Salazar L.
Contact urticaria caused by heat-sensitive raw fish allergens. Pastorello EA, Pravettoni V, Ispano M, Farioli L, Ansaloni R, Rotondo F, Incorvaia C, Asman I, Bengtsson A, Ortolani C.
Identification of the allergenic components of kiwi fruit and evaluation of their cross-reactivity with timothy and birch pollens. Makinen-Kiljunen S, Kiistala R, Varjonen E.
Severe reactions from roe without concomitant fish allergy. Anisakis simplex: sensitization and clinical allergy. Das Dores S, Chopin C, Romano A, Galland-Irmouli AV, Quaratino D, Pascual C, Fleurence J, Gueant JL. IgE-binding and cross-reactivity of a new 41 kDa allergen of codfish. Bernhisel-Broadbent J, Scanlon SM, Sampson HA. Fish hypersensitivity. I. In vitro and oral challenge results in fish-allergic patients. Codfish allergy in adults. Identification and diagnosis. Hansen, T. K.; Bindslev-Jensen, C.; Stahl Skov, P.; Poulsen, L. K.
Clinical reactivity to fish studied by multiple double-blind placebo controlled food challenged (DBPCFC). Hansen TK, Stahl Skov P, Poulsen LK, Bindslev-Jensen C.
Allergenic activity of processed fish. Van Do T, Elsayed S, Florvaag E, Hordvik I, Endresen C.
Allergy to fish parvalbumins: studies on the cross-reactivity of allergens from 9 commonly consumed fish. Experimental Masses:12.5, 24, 38 and 51 kDa (Das Dores et al. 2002 ). Oligomeric Masses:Monomers are the main species. 24 kDa Dimers, 38 kDa trimers and 51 kDa tetramers, possibly disulfide linked, have been reported by Das Dores et al (2002) . Oligomers are well established for distantly related parvalbumins. Bugajska-Schretter et al. (1998)  show that IgE binding is very much stronger in the presense of calcium, when the protein is in its native folded form, suggesting that the epitopes are primarily conformational. Elsayed et al. (1991)  used synthetic peptides to determine that peptides corresponding to residues 33-44, 65-74 and 88-96 are IgE binding epitopes. The peptide corresponding to residues 49-64 was also allergenically/antigenically active. A peptide corresponding to residues 88-103 functioned as a monovalent hapten, blocking and not eliciting allergic reaction. Process, chemical, enzymatic:Parvalbumins are stable and quickly refold in the presense of calcium. Thus the allergenic activity survives boiling or frying (Hansen et al. 1994 ). They are relatively resistant to pepsin above pH 2.5 (Untersmayr et al. 2005) . 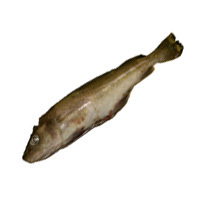 Gad c 1 from cod is a beta-parvalbumin. IgE cross-reactivity between the parvalbumin allergens found in most fin fish (Bugajska-Schretter et al, 1998 ; Helbling et al, 1999 ; Sten et al, 2004 ). Van Do et al (2005)  used SPT and ELISA inhibition with 12 patients and their sera to characterize the cross-reactivities of native and some recombinant parvalbumins from 9 species (cod, Gadus morhua, Atlantic salmon, Salmo salar, Atlantic mackerel, Scomber scombrus, tuna, Thunus albacares, herring, Clupea harengus, wolffish, Anarhichas sp., halibut, Hippoglossus hippoglossus, flounder, Platichthys flesus, and Alaska pollack, Theragra chalcogramma). Cross-reactivity was generally observed although some parvalbumins and extracts were poor inhibitors of IgE binding to cod for some sera i.e. 2/10 sera did not show inhibition by salmon parvalbumin (although surprisingly recombinant salmon parvalbumin caused inhibition). Hilger et al. (2004)  and Hamada et al. (2004)  show that there is also IgE cross-reactivity between fish and frog parvalbumin allergens. Allergen properties & biological function:Parvalbumins control calcium flow in the muscular sarcoplasm. Recombinant cod parvalbumins were expressed with histidine tags in E. coli, using the vector pET-19b, and purified from soluble fractions. Parvalbumin with an N-terminal MGHHHHHHHHHHSSGHIDDDDKH tag (His10-T1), containing a cleavage site for enterokinase to allow removal of the tag, gave a single symmetrical peak by HPLC. The yield of His10-T1 was 1.8 mg/200 ml of bacterial culture (Van Do et al. 2003 ). Das Dores et al. (2002)  give a sequence with a single change (a deletion) relative to http://us.expasy.org/cgi-bin/niceprot.pl?Q90YK9 (Van Do et al. 2003 ). They comment that the original Gad c 1 sequence, http://us.expasy.org/cgi-bin/niceprot.pl?P02622, derived from peptide sequencing is significantly different from the DNA derived sequences and from sequences from other fish. Van Do T, Hordvik I, Endresen C, Elsayed S.
The major allergen (parvalbumin) of codfish is encoded by at least two isotypic genes: cDNA cloning, expression and antibody binding of the recombinant allergens. Das Dores S, Chopin C, Villaume C, Fleurence J, Gueant JL. A new oligomeric parvalbumin allergen of Atlantic cod (Gad mI) encoded by a gene distinct from that of Gad cI. Elsayed S, Apold J, Holen E, Vik H, Florvaag E, Dybendal T.
The structural requirements of epitopes with IgE binding capacity demonstrated by three major allergens from fish, egg and tree pollen. Protein Family:Gelatine is derived from denatured collagens. Process, chemical, enzymatic:Gelatine is a denatured aggregate. Nature of main cross-reacting proteins:No IgE cross-reactivity between fish and bovine gelatine was observed by Sakaguchi et al. (2000) . Allergen properties & biological function:Collagens are the major structural proteins of skin. Allergen purification:Fish gelatine used by Sakaguchi et al. (2000)  was prepared by 0.5 M acetic acid extraction and purified by differential salt precipitation from heat treated fish skins. Other biochemical information:This entry for fish gelatine is included because IgE binding was reported by Sakaguchi et al. (2000)  and SPT was observed in 3/30 patients (and histamine release in 7/30) by Hansen et al. (2004) . However, Hansen et al. have shown that it is unlikely to be a clinically important allergen.